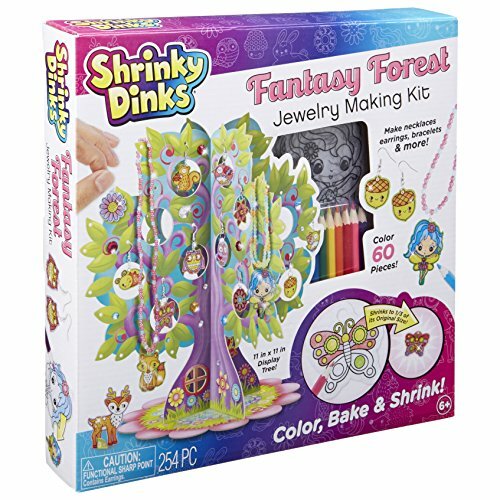 Shrinky Dinks Fantasy Forest Jewelry Making Kit is a magical way to spend a day indoors! Color, bake and shrink owls, butterflies, flowers and more. Make fantasy charms, necklaces and earrings and hang them from a tree shaped holder. Shrinky Dinks sheets are made of a special thin, flexible plastic which, when heated in an oven, shrink and harden without altering their color or shape. We precut all the fun shapes in every one of our kits to make them easy to work with! Includes 60 preprinted and precut Shrinky Dinks, 10 paperboard stands, 3-piece jewelry tree, 100 sticky gems, 0.7oz. of beads, 8 colored pencils, 10 earring hooks, 100in. elastic string, 30 glue dots, 30 jump rings, beading needle and easy instructions. Recommended for children 6 years of age and older. 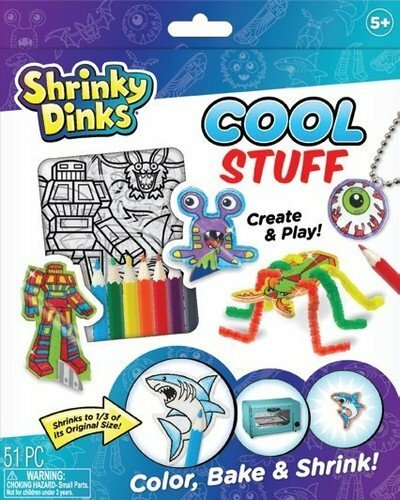 Shrinky Dinks Cool Stuff Activity Set is an awesome way to spend a day indoors! Color, bake and shrink a bat, monster truck, eyeball, alien, insects and more. Shrinky Dinks sheets are made of a special thin, flexible plastic which, when heated in an oven, shrink and harden without altering their color or shape. We precut all the fun shapes in every one of our kits to make them easy to work with! Includes 21 preprinted and precut Shrinky Dinks, 8 color pencils, 8 stands, 6 pipe cleaners, 2 key chains, 6 magnets and easy instructions. Recommended for children 5 years of age and older. Shrinky Dinks Minis Mermaids is a pleasant way to spend a day indoors! Color, bake and shrink mermaid and sea creature figurines. Connect their pieces to their stands and make up exciting adventures for them. Shrinky Dinks sheets are made of a special thin, flexible plastic which, when heated in an oven, shrink and harden without altering their color or shape. We precut all the fun shapes in every one of our kits to make them easy to work with! Includes 10 preprinted and precut Shrinky Dinks, 8 colored pencils, 10 stands and easy instructions. Recommended for children 5 years of age and older. Shrinky Dinks Ballerina Jewelry Activity Set is a lovely way to spend a day indoors! Color, bake and shrink ballerinas, slippers, bows and more. Make a charm bracelet, necklace and earrings. Shrinky Dinks sheets are made of a special thin, flexible plastic which, when heated in an oven, shrink and harden without altering their color or shape. We precut all the fun shapes in every one of our kits to make them easy to work with! Includes 10 preprinted and precut Shrinky Dinks, 8 color pencils, chain bracelet, 2 earring hooks, 10 jump rings, elastic loop and easy instructions. Recommended for children 5 years of age and older. 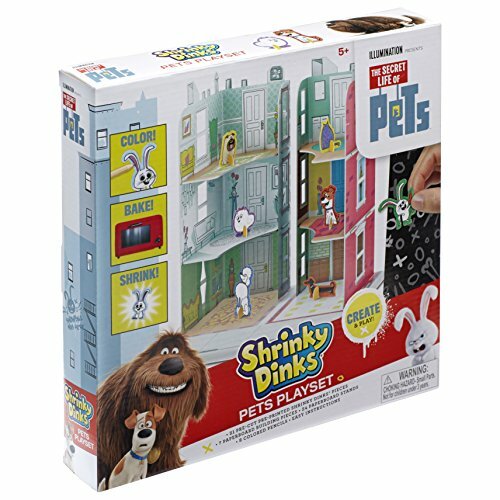 The Secret Life of Pets Shrinky Dinks Playset makes you part of the adventure. Color, bake and shrink Max, Chloe, Gidget, Snowball and all of your favorite characters from the movie and send them on adventures! Or keep them locked up all day to see what they do. Includes 21 Pre-cut Pre-printed Shrinky Dinks Pieces, 7 Paperboard Building Pieces, 24 Paperboard Stands, 8 Colored Pencils and Easy Instructions. Recommended for children 5 years of age and older. 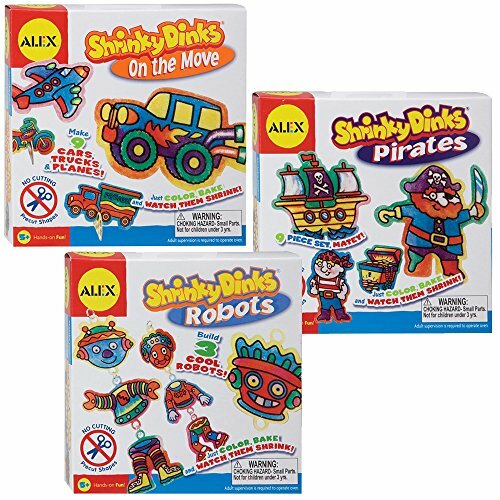 Bundle 3 of Shrinky Dinks Kits for Boys Includes Pirates, Cars & Robots. Color designs, bake in the oven, and watch the plastic shapes shrink to 1/3 of its original size. Each kit contains 9 pre-cut plastic shapes, 8 color pencils, and instructions. Kit measurement: 6" x 6" x 1.5"Recommended for ages 5+. Adult supervision is required to operate oven. 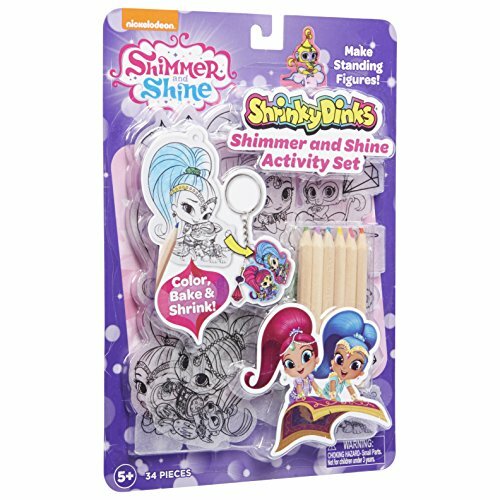 Shimmer and Shine Shrinky Dinks Activity Set gives you characters from the animated series that you can color, bake and shrink, turning them into stand up figurines! Make Shimmer, Shine, Nahal, Tala and more! Stand them up and have them play with each other. There's materials to make a keychain! Includes 12 Shrinky Dinks, 6 colored pencils, key ring, chain, 12 stands, 3 jump rings and instructions. Recommended for children 5 years of age and older. 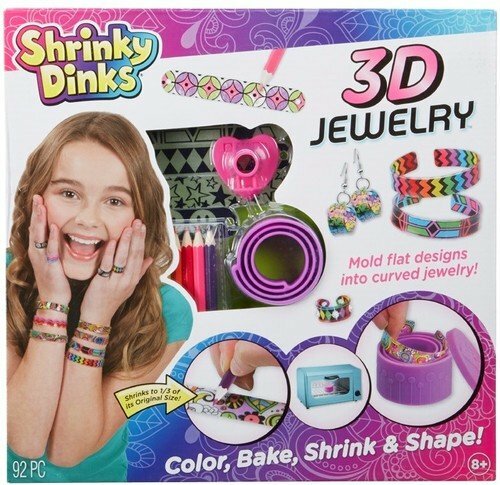 Shrinky Dinks Bake & Shape 3DJewelry lets you take your Shrinky Dink jewelry to a new dimension! Just use the silicon mold to bake thin flexible flat Shrinky Dink shapes into thick sturdy plastic cuffs. Comes with earring and ring mold too! All you have to do is design and color, slide into the mold, then bake in the oven. It's easy and safe. This complete set includes silicon ring mold, silicon bracelet mold, 12 bracelet, 4 earring and 10 ring pre-cut and pre-printed Shrinky Dinks shapes, 4 earring hooks, 4 jump rings, 48 sticky gems, 8 colored pencils and easy instructions. Recommended for children 8 years of age and older. Shrinky Dinks Midnight Jewelry is an excellent way to spend a day indoors! 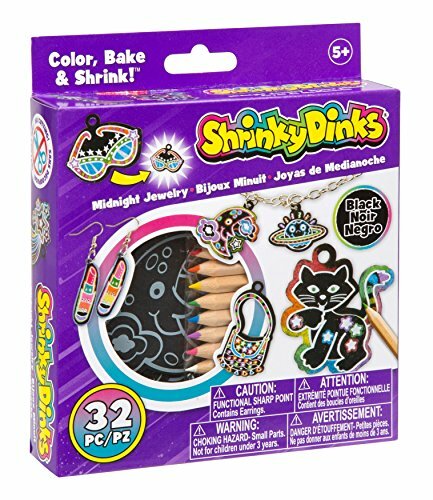 Color, bake and shrink with special black plastic Shrinky Dinks. Make fabulous charms, necklaces and earrings. 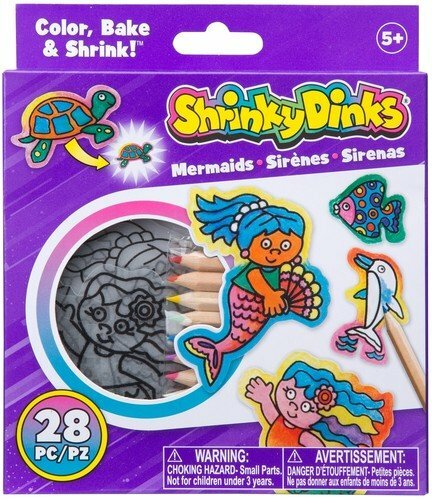 Shrinky Dinks sheets are made of a special thin, flexible plastic which, when heated in an oven, shrink and harden without altering their color or shape. We precut all the fun shapes in every one of our kits to make them easy to work with! Includes 10 preprinted and precut Shrinky Dinks, chain bracelet, 2 earring hooks, 10 jump rings, elastic loop and easy instructions. Recommended for children 5 years of age and older. http://www.alexbrands.com/pa_brand/shrinky-dinks/ Classic Shrinky Dinks® with a cool new twist and awesome ALEX® Designs! Shapes are preprinted and precut — no tracing or cutting required. 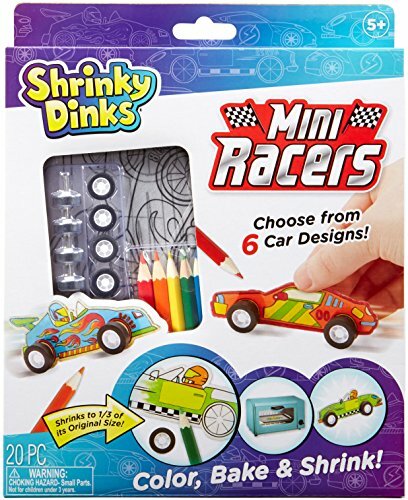 Compare prices on Alex Toys Shrinky Dinks at ShoppinGent.com – use promo codes and coupons for best offers and deals. Start smart buying with ShoppinGent.com right now and choose your golden price on every purchase.